During broad daylight I shot this image, its really a summed image of 23 images each about 1/1000" exposed at f8 with an 400mm/5.6 Canon tele. Summing was done with the software MIRA. 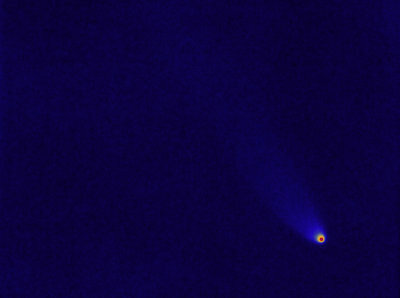 Here a special color pallette enhances fine details and reveal the long tail of this comet also in daylight !